The B15 seems like a budget phone in a well-constructed case. It's 3G only, has a weak processor and camera, and the display is none to sharp. The battery is a bit small at 2000 mAh, which is worrying on a phone that should be reliable above all else. You probably know Cat or Caterpillar as the guys in yellow and black, makers of construction equipment and those boots the cool kids were wearing for a little while. Now you can add smartphones to that list, thanks to the Cat B15. Actually, the phone is made by Bullitt Mobile, a licensee of Cat, and this isn't its first smartphone rodeo. Its already made a couple of phones under the Cat name, and it launched the Cat B15 at MWC 2013 in Barcelona. This rugged device has been available in Europe for a little while, and is making its North American debut at a pre-show event for CTIA 2013. 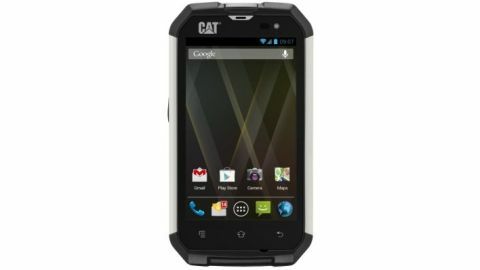 The Cat B15 has a rubber and aluminum shell with a sweet Android 4.1: Jelly Bean center. It's built to make calls and survive falls; with just a 5-megapixel camera and dual-core 1GHz processor, it's not designed for much else. As we mentioned, the Cat B15 has been available in Europe for a while now, and can actually be purchased as an unlocked device directly from Cat for $349/£300. Representatives showing the device couldn't name the U.S. carriers that will carry it. However, we'll tell you that the Cat B15 is a GSM phone, so therefore AT&T and T-Mobile are your likely candidates. No dice with GSM carriers Sprint and Verizon. It's also 3G only, so forget about up-to-date data speeds. Like a lot of rubberized and ruggedized phones, such as the Kyocera Torque, the Cat B15 looks like a phone in a heavy rubber case. Phones like this are bulky by nature, but it does seem like Cat has slimmed down the B15 as much as possible. The B15 is just shy of 5-inches, with a width of 2.7-inches and .58-inches of thickness. It also feels pretty good, and doesn't weigh too much, just 5.9 oz. Its rubber body casing and aluminum sides give it the look of a toolbox or an eye-catching screwdriver. The display is a 4-inch 480 x 800 screen resolution. But get this: it's designed to detect and stand up to a wet finger, because the Cat B15 is waterproof at a depth of up to 1 meter, for thirty minutes. We actually had the chance to wet our digits and give the phone a swipe, and it did indeed work. Frequent snorkelers, we may have your next phone here. The manufacturer also claims the B15 is "impervious to dust," which is likely thanks to all the rubber seals fitted in each and every port. The headphone jack seals up, as does the micro-USB charging port. It's also rated for a drop of up to six feet, which should be more than enough to survive a tumble from your hand to the floor. Cat representatives on hand were eager to drop the phone and prove this claim. Getting back to the build, one of the things we like least about a smartphone case is how it makes the buttons difficult to push. Luckily, the B15's yellow rubber buttons weren't too bad. They didn't press as easy as an iPhone 5's unlock button, but they didn't take too much effort, either. You wouldn't think it, but the B15 actually has an open body design. It takes some doing, but you can unlatch the back and open it up to reveal a 2000 mAh battery and microSD slot. There's only 4GB of on board storage, so it's a good thing you can add an additional 32GB. Of course, this isn't really a media centric or image snapping phone. The camera is only 5-mp and the processor is low-end, but flipping across menus and diving into the app drawer, the B15 was no slouch. We didn't detect any stuttering, and the browser opened with acceptable speed. We'd guess that's Jelly Bean at work, as the B15 runs a version that's darn close to stock. We noticed just one toolbar that smacked of manufacturer meddling. When a brand like Cat enters the smartphone game, it's tempting to look at it as selling a name, not a phone. Cat has parleyed its black and yellow good looks and blue collar street cred into clothes, boots, watches and more. Its even appeared at London Fashion Week. We won't know if Cat is a smartphone dilettante until we have the B15 in for a full review, but there's a good chance the phone could prove it's worth, and frankly, phones like this could use a little style. We've all seen far too many hideously shattered iPhones and over-the-top protective cases. If someone could sell a tougher phone to that crowd, not just construction workers, they'd be doing the world a favor. Ultimately though, the B15 seems like a budget phone in a well-constructed case. It's 3G only, has a weak processor and camera, and the display is none to sharp. The battery is a bit small at 2000 mAh, which is worrying on a phone that should be reliable above all else. However, the close to stock Android OS intrigues us, and we have to admit, we're charmed by the phone's sturdiness, and the eagerness of Cat reps to beat it up for us. Keep your eye out for our full review, and an update whenever we get some carrier info.